The baby craze is here in Kuwait, too!!! Last weekend, the Georgian lady and I hosted a brunch for the Irish journalist's wife (just the 3 of us), to celebrate her pregnancy (she's due this spring with their 2nd baby), and we hosted another (much) larger baby shower this weekend at Ladurée in 360º Mall. We had a blast at BOTH showers, and I have to say that in spite a few bumps in the road along the way, the most difficult and stressful was the idea of a baby shower. The Georgian lady reminded me that the concept of a baby shower didn't even exist in Georgia and I felt like such an idiot. I hadn't even considered the cultural discrepancies! For example, in Georgia and in some other countries, it is traditional to give gifts for a baby AFTER the baby is born as any kind of celebration or gift-giving before is considered bad luck (*facepalm insertion here*). What had I done?!? 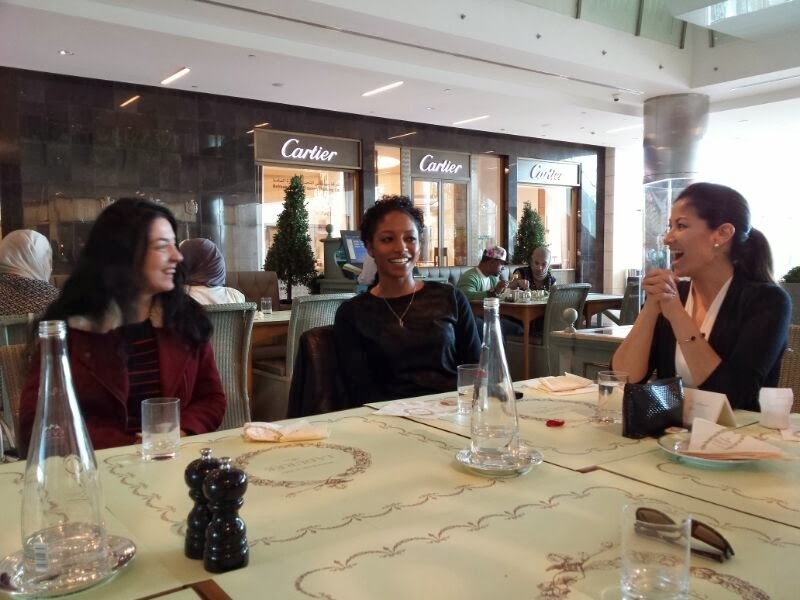 We hosted the second brunch for a Greek woman who lived in South Africa (talk about mixed nationalities! To add to it, she's lived in 4 different countries!). She's a teacher at the uni I used to work at and I'd met her last spring through the Georgian lady and Irish chef (he hangs out with the Greek woman's husband). 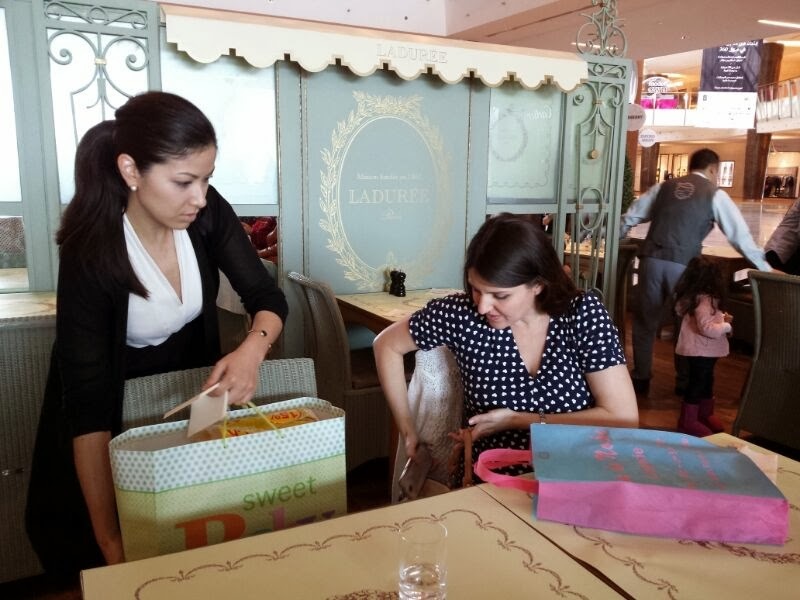 There were several different nationalities combined at the 2nd shower, so I learned quite a bit about baby shower/celebration etiquette in other countries! We were quite a mixed group: Georgian, Greek, Lebanese, Turkish, American, Japanese Canadian among others! I didn't even get a chance to speak with all of the ladies in attendance, so I'm still not sure of a few women's nationalities (although I knew most of the guests, there were a few new teachers I wasn't acquainted with). I would like to commend Ladurée for doing an AMAZING job! I know careful planning is always a plus, but the restaurant made everything seem so seamless! Upon arrival (the Georgian lady and I went early), the table was arranged: set, place settings-complete with place cards, water at the ready. We quickly wrote the name cards, did the seating arrangement and put our gifts on the gift table. Our guest of honour arrived first. Her husband had brought her (being first time parents maybe he's not a fan of letting his wife wander too far out of sight? ), he dropped her off, said his hellos and good-byes, enquired after the Irish chef and left us. The staff immediately ensured we had water and drink menus. Once everyone had arrived, we finished ordering our drinks and food was brought out: first the dessert on three-tiered curate stands and then mini sandwiches (cheese, chicken and feta with tomatoes and basil-yum!). We chatted and ate, enjoying the company; it's always nice to see co-workers outside of work. The three-tiered curate stands full of macaroons, mille feuille, chocolate cakes and tartes! Mmmm, FOOD! Strawberry mille feuille! By the way, does anyone else think mille feuille and sfoglia (an Italian pastry) taste similar??? Once we'd managed to eat ourselves silly, the table was cleared so that the guest of honour could open the presents. There were lots of oooohs, ahhhhhhs and laughs! We managed to spend three and a half hours there and not once were the staff overbearing, annoying or even in the way. They were extremely polite, obliging and kind. The manager, Rolad, is wonderful! 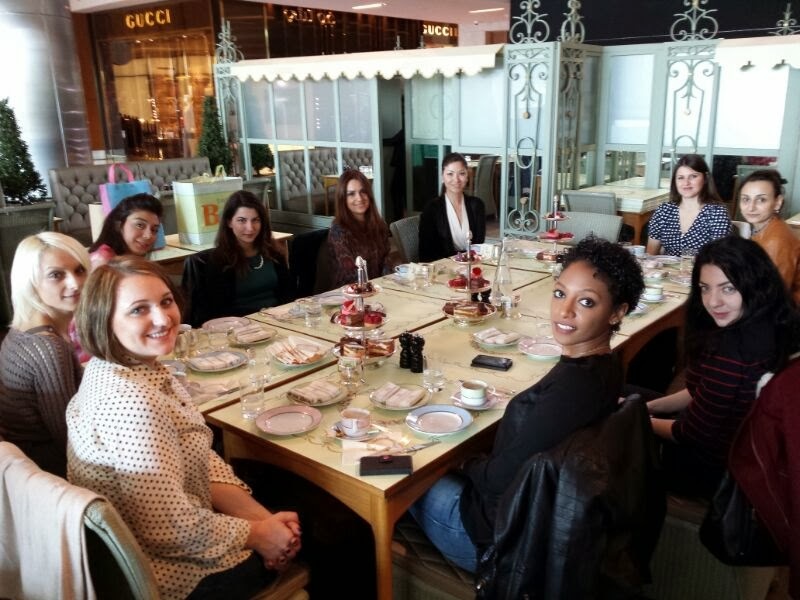 For anyone out there, Kuwaiti or otherwise, who wants to plan a get together (baby shower, bridal shower, nice lunch out, etc....), I think Ladurée is a phenomenal choice. They took care to make sure that the whole event ran smoothly and I am very thankful to them! This is one place I won't stop recommending!!! Opening presents! The guest of honour was so sweet asking me what the custom was with gift-opening (in front of attendees or in private. She wanted to make the guests happy). All of the guests, minus the lady taking the photo. Look at those pretty faces! Thank you everyone for waking up so early during a looong weeked! That looks like so much fun! And you're such a sweetie to be organizing something like this!